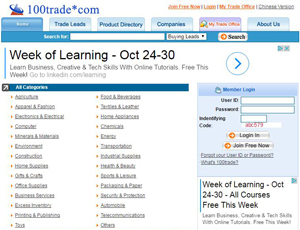 100trade.com is an International Imports And Exports Business Trading B2B Marketplace. Global B2B marketplace of export and import, offers company directory, product catalogs and trade leads to importer, exporter, manufacturer, wholesaler, supplier. About 100trade.com - Imports And Exports Business Trading B2B Marketplace's recommend,only on behalf of the views and opinions about B2B Directory, if you have any suggestions , please feel free to contact with us, we will amend and correct them in the first time according your suggestions. More better B2B Websites recomend, Please click here.